Sweet, simple, and very special, these socks are just like amaretti cookies - once you give them a try, it’s impossible to stop! The pattern is easy to memorize and fun to knit, while the broken rib stitch gives the finished pair elasticity together with a nice look. 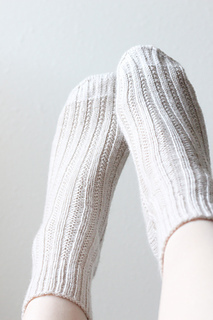 Socks are knitted from the top down with a heel flap. Both the toe and the heel are reinforced with slipped stitches. With the stitch pattern that looks great in any kind of yarn - from solids to complex handdyed skeins, - Amaretti Socks are going to be a treat both to knit and to wear. There are directions for stitch distribution for both the magic loop and the DPNs. The pattern has both the written row-by-row instructions and the charts. Sizes available - S (M, L): sock width 7.5-8”/18.5-20cm (8-8.5”/20-21.5cm, 8.5-9”/21.5-23cm). Length is completely adjustable.